Edgewood mariachi students perform in the lobby of the district's performing arts theater before its first State of the District. The Edgewood school district wants to convert many of its neighborhood campuses to specialty schools over the next five years. Superintendent Eduardo Hernández introduced the plan Thursday during the district’s first State of the District presentation. TPR's Camille Phillips reports on Edgewood's five-year plan. The zones will be focused on five different program models: early childhood, STEAM (science, technology, engineering, arts and mathematics), culinary arts and health sciences, single-gender leadership schools and fine arts. Edgewood is one of several San Antonio districts losing students to other schools, including charter schools. Its enrollment has dropped almost 10 percent since the state took control of the district in 2016. The Texas Education Agency appointed a board of managers to replace Edgewood’s elected board after in-fighting left the district without a superintendent for nearly a year. Since then, Edgewood has had a revolving door of school chiefs and interim superintendents. Hernández asked parents to give him a chance to earn their trust when he took the helm in July. He described the State of the District presentation as a concrete way to earn that trust. “Over the last few years I think there has been a break in the relationship between the school district and the local community, so this is our first invitation to come back home,” he said. 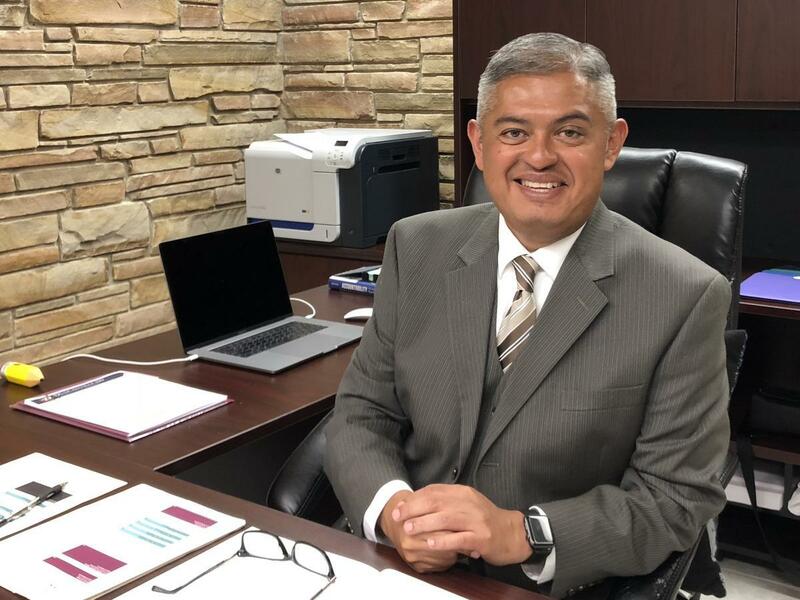 Edgewood Superintendent Eduardo Hernandez poses for a portrait in his office during his first week at the district. Business leaders and community members were greeted by students with a handshake as they arrived at Edgewood’s performing arts theater for the event. The guests ate meals prepared by culinary arts students from Memorial High School while Hernández and other district leaders outlined their vision for the future. Peña said he wants to follow his brother to Texas A&M University, but there are limited opportunities at Edgewood to help him prepare for a career as a mechanical engineer. Hernández wants to change that by creating the five innovation zones. “Talent is not restricted to zip codes. It’s opportunities that our kids don’t have. That’s what thinking outside of the box is to me. It’s engaging in partnerships that maybe as educators we haven’t done in the past,” he said. His five-year plan would build on the two new programs launched this year: a STEAM academy at Brentwood Middle School and an early childhood program at Gardendale Elementary managed by Pre-K 4 SA. Hernández said principals interested in starting new school models — like single-gender leadership — will be given a year off from their normal duties to research the model and get community input. He’s also pursuing management contracts for other schools like the one Edgewood recently signed with Pre-K 4 SA. Edgewood spokeswoman Keyhla Calderon-Lugo said it’s too soon to say how many of the district’s 20 campuses will become specialty schools because it will be based on interest from staff, students and parents. She said the plan is for the new school models to be open to anyone in Bexar County. Starting next school year, the city’s preschool program will operate an early education center in the Edgewood Independent School District. “What do we as a district need to continue to do? What do we as a district need to start doing? And what do we as a district need to stop doing?” said Hernandez, sitting in his new office on San Antonio’s west side.